Richard W. Bagot was born in Lancaster, England October 3, 1832, and the son of William and Mary Bagot. His father was a silk merchant and may have been fairly well to do since Richard received a good education. In 1855, Richard came to New York City and later traveled to Buffalo, New York. In May of 1858 he arrived in Elk Rapids aboard the schooner George Davis along with 40 other passengers. Richard worked briefly for Abram S. Wadsworth and for Lemuel R. Smith. He then worked for Dexter & Noble. At first he worked in the logging camps; but, it was discovered that he had a good knowledge of accounting and he then started working in the office. According to the Grand Traverse Herald, he was drafted in 1864; but, that seems questionable because it was during this period that he married for the first time on July 25, 1864 to Henrietta C. Smith, the adopted daughter of Lemuel Smith. Their daughter Alice Maude Mary was born June 19, 1869 at Adrian, Michigan. Alice was baptized at St. Paul's Episcopal Church on April 24, 1870. In November of 1864, Richard was first elected county clerk and registrar . He was re-elected in 1865, 1868, and 1870. Richard held both positions until 1879 when the county seat was moved to Bellaire. 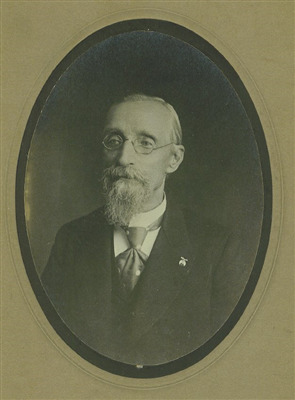 He was also secretary of the Elk Rapids Masonic Lodge when it was formed in March of 1869. Richard stayed with Dexter & Noble until 1871. He then went to work for J. H. Silkman at his store on Torch Lake. It was there, on November 18, 1872, that Henrietta died of consumption; she was 27. She was buried in Maple Grove Cemetery in Elk Rapids. Richard later sold the cemetery plot to William Gay. In 1873 Richard returned to Elk Rapids and entered into the grocery and drug business in partnership with George H. Bailey, a local physician who had arrived in Elk Rapids in 1871. The partnership prospered and required them to build an addition to their building located on River Street. In 1876, he bought out Dr. Bailey and in 1879, expanded the building again. In the fall of 1881, because of poor health, he sold the business to Rushmore and Holdbrook. However, he continued to be active in real estate and the lending business. In 1891, he joined the Elk Rapids Savings Bank and became a cashier. Iin 1904, he became its president. In 1893, he was elected to the Michigan State Legislature for one term. Richard W. Bagot died March 27, 1907; he is buried at Maple Grove Cemetery. The Bagot home is located in the Village of Elk Rapids, on the corner of River and Oak streets. Richard Bagot was a man of contradictions. He was educated and intelligent. He served on the parish vestry at St. Paul's for over 30 years. He was active in his Masonic lodge and a member of Commandery and Shrine. He became prosperous and spent his winters in Florida, stopping at New York to visit old friends. Perhaps, like another lender and real estate dealer of his time, he might have been described as "a bit sharp." When his first wife, Henrietta, died in November of 1871, his daughter Alice was sent downstate to stay with friends and did not return until June of 1874. Four different sources refer to Alice Maude as adopted. At the time of her death in March 17, 1909 it was stated that she died of a heart difficulty.